A last minute point by Ken Rothwell sealed an important win for Ballinlough on Friday night, and ensured that they are in a strong position going into next weeks final round of B-League fixtures. Both teams entered the contest knowing that a win was a must in order to retain hope of reaching the league final, but it was Clann na nGael who were out of the blocks quickest, opening up a 1-5 to 0-0 score lead after twenty five minutes. The visitors were piling forward in numbers, leaving the Ballinlough defence under severe pressure for large spells of the opening period. Former All Ireland winning captain Graham Geraghty was a particular thorn in Ballinlough’s side during the opening exchanges, and was ably assisted by a strong full forward line. Ballinlough’s sole score of the first half was a well taken goal by hard working mid fielder Seamus Fagan, who’s powerful shot gave no chance to the Athboy keeper. This score came towards the end of the opening half, and saw Clann na nGael go into the change of ends leading by five points. The second half proved to be a completely different affair, as Tom Shine’s charges began to dominate proceedings and were very quickly back on level terms. This was largely due to the work of Fagan, Kevin Beirne and Junior O’Reilly who were winning the lion’s share of possession around the middle of the field. Jack Tunney got the ball rolling for the hosts when he split the posts with a lovely curling effort off his left foot, before Paddy Briody got one of the games best points, an exquisite shot off the outside of the boot from a tight angle. Ballinlough soon got their second major score of the evening when Jonathan Francis Montgomery was on hand to finish to the roof of the net, after Tunney played a great ball into the path of full forward Simon Deevy who laid it off to the speedy young forward. The sides were now back on level terms, as Ballinlough continued to dominate. Just minutes later, they got into the lead for the first time, as Deevy used his strength to break free of the Clann na nGael defence and rifled a shot into the back of the net. A well worked point from Ken Rothwell followed soon after to put his side four points to the good. Clann na nGael began to regain a foothold in the game midway through the half, and found the back of the net for the second time. The action was end to end at this stage and the lead soon changed hands again as the Athboy outfit edged in front. Ballinlough were not about to let this game slip away however, and kept tagging on scores of their own. Deevy finished off a great team move with a fine point, before Niall Farrelly fired over a stupendous score from distance, which capped a tireless display in the middle of the park where he was a vital link between defence and attack. Adam Fox confidently converted a free for the hosts shortly after being introduced to tie matters up again, with just minutes remaining on the clock. The visitors went all out attack for the remainder of the contest, but Ballinlough were rock-solid at the back, with James O’Keefe, James Baugh and Emmett Smith particularly to the fore, their heroic defending ensuring that Clann na nGael did not get back in front. A flowing move from the back in the dying seconds saw Rothwell get on the ball, and the veteran forward made no mistake to clinch victory for Ballinlough. 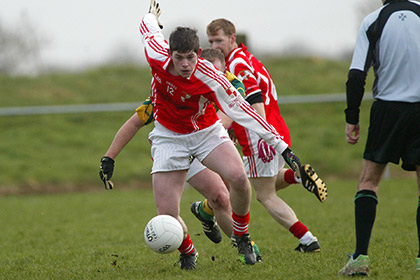 The ‘Reds now face Skryne on Monday night, where victory would ensure promotion and a place in the final. Ballinlough: L. Gibney, J. Baugh, J. O’Keefe, J. Farrelly, D. Francis Montgomery, E. Smith, K. Beirne, N. Farrelly (0-1), S. Fagan (1-0), P. Briody (0-1), J. O’Higgins, Junior O’Reilly, J. Tunney (0-1), S. Deevy (1-1), K. Rothwell (0-2). Subs: J. Francis Montgomery (1-0) for J. O’Higgins, M. Farrell for J. Farrelly, P. Monaghan for P. Briody, A. Fox (0-1) for J. Tunney.